The Angriest: Star Trek: The Next Generation: "Eye of the Beholder"
Star Trek: The Next Generation: "Eye of the Beholder"
It is 28 February 1994, and time for another episode of Star Trek: The Next Generation. When a crew member commits suicide, Counselor Troi (Marina Sirtis) begins to suspect that their death may be related to a previously undiscovered murder while the Enterprise was under construction. "Eye of the Beholder" takes and ruins a pretty cool premise: that there's been a dead body sealed inside one of the Enterprise's bulkheads for close to seven years. It also sets off in a pretty bold direction for mid-1990s science fiction drama by starting things off with a suicide. From there it runs pretty enthusiastically downhill. The individual elements all have merit, but some specific creative choices halfway through scuttle the whole thing by the end. It's a shame, because I think the episode has genuine potential. The idea of a dying telepath leaving behind a sort of dangerous psychic residue is a relatively intriguing one, and it is one that naturally suits an empath like Troi. Where the episodes makes it's greatest mistake is in throwing Troi into a psychic dream world at the episode's mid-point, making almost everything that occurs afterwards fairly irrelevant. The Worf-Troi romance with which the writers have been toying gets a kick-start, but it's entirely illusory. Matters aren't helped by some jaw-droppingly odd acting and direction. 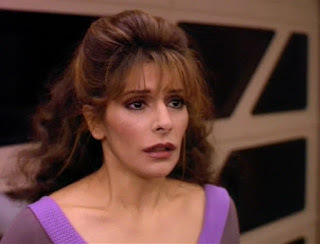 Troi speaks with the suicide victim's girlfriend (Johanna McCloy), who seems less grief-stricken and more mildly perturbed by her partner's death. Both Marina Sirtis and Michael Dorn struggle to bring the Worf-Troi romance to life, and when the script requires Sirtis to become so upset at Worf's infidelity that she stone-cold murders him things really become unworkable. The dream world is one thing, but making Troi act so wildly out of character makes it impossible to be fooled. It is also slightly odd for the revealed killer to be played by Mark Rolston, an actor with enough prominent appearances on his CV - he's also in Aliens, Lethal Weapon 2, The X Files, 24, Robocop 2, The Shawshank Redemption and the Saw franchise - to be really distracting right when the episode wants you to be immersed in the drama. "Eye of the Beholder" is just a poorly developed episode made from a somewhat interesting concept. Season 7 now sits at nine good episodes out of 18, with the quality ratio dropped down to 50 per cent.